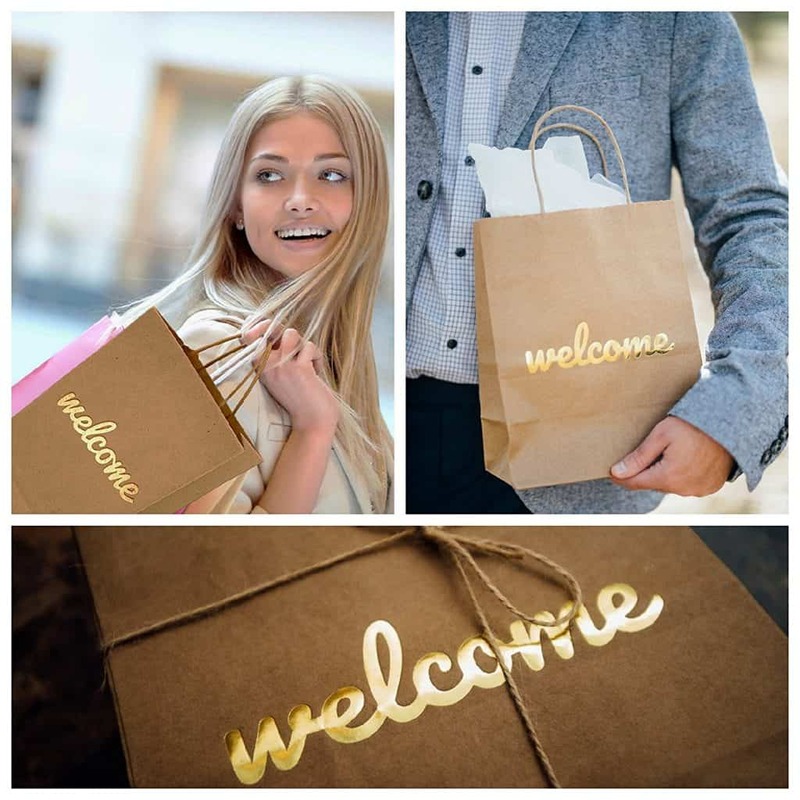 Merry Expressions – Wedding Gift Bags (25 Pack) with Gold Foil “Welcome” Printed. Beautiful Kraft Brown Paper Bags With Twisted Handle. Perfect For Favors, Bridal & Baby Showers, Birthdays, Parties & Beach Weddings. Comes with a comfy grip and a beautiful “Welcome” gold foil. It has a strong bottom of cardstock. It’s perfect for birthdays, bridal showers, baby showers, retail, weddings & parties. ERGONOMIC TWISTED HANDLE: Minimize hand fatigue and facilitate holding to the fullest, thanks to their reinforced and twisted handles! DISCOVER THEIR MULTIPURPOSE ROLE: Ideal for hotel guests, birthday party favors, bridal and baby showers, wedding gifts, and more. 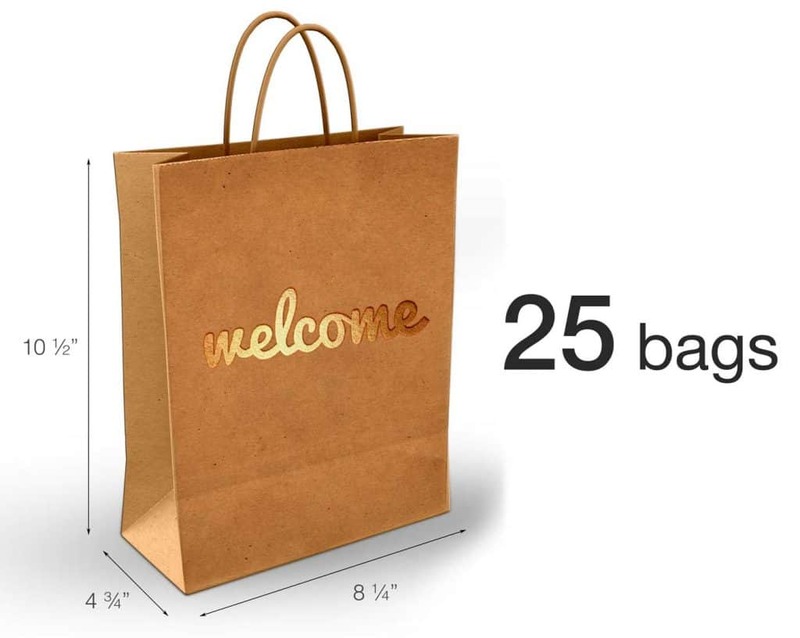 EACH PACK CONTAINS: 25 elegant and sleek paper bags. 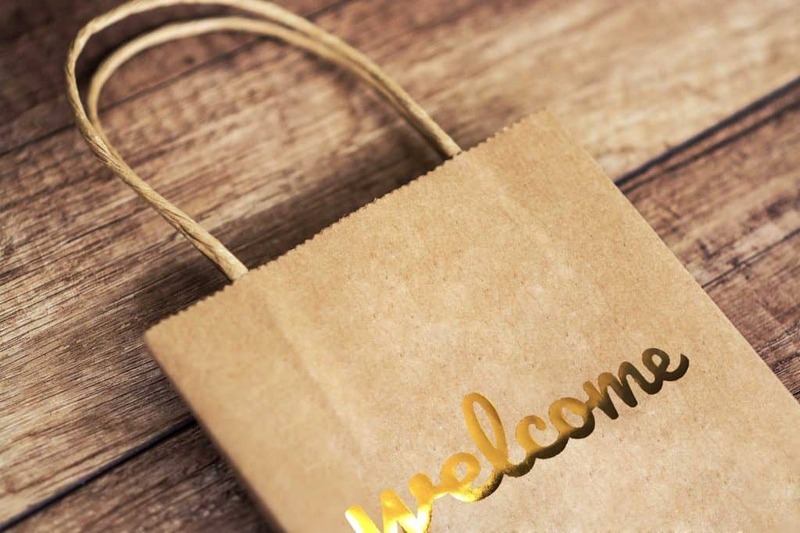 Handwritten with gold foil, is the word “Welcome”. Supportive cardboard on the bottom. HOLD ANYTHING YOU WANT: Generous size 8″L x 4.75″W x 10.5″H. Carry snacks, gifts, goodies, treats, clothes, souvenirs, and others! QUALITY BAGS MADE TO LAST: These eco friendly and reusable kraft paper bags can withstand everyday tear and wear! Use them again and again! Create Wonderful Memories & Joyous Moments With Merry Expressions Kraft Paper Bags! … well designed paper bags? … ways to satisfy your guests? … the coolest party favor bags? … retail bags for your shop? No more searching. We have the finest and most elegant paper bag set designed for you. Each pack contains 25 kraft paper bags. Need more? Order a few extra packs and enjoy! Ideal for both personal and professional use. 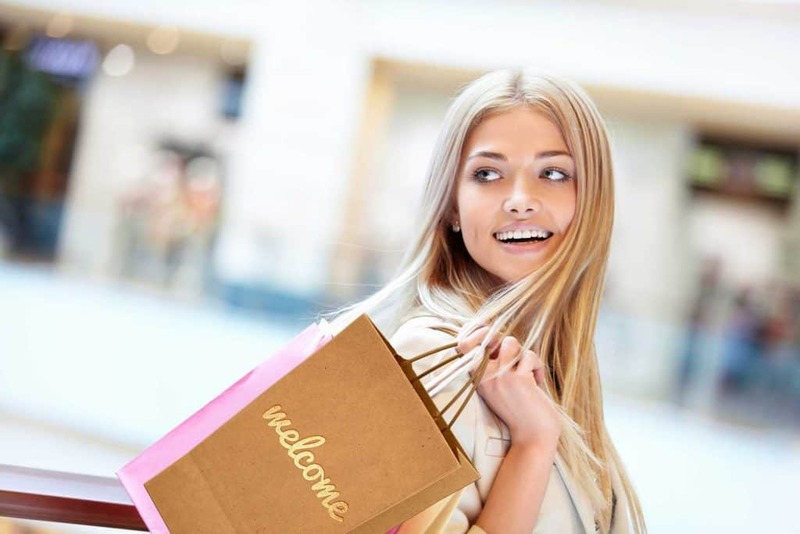 Surprise your customers the next time they visit your store or create the loveliest memories for your guests at your next party. Generous Size Paper Bags Hold All The Things You Need! Combining an excellent craftsmanship, sturdy bottom and ergonomic handles, our paper gift bags are here to accommodate even your most demanding party needs! Their generous but not bulky size 9″L x 4″W x 8″H make these party favor bags an absolute must have addition to any festive occasion! Place inside anything that comes to mind. From little towels, toys, birthday party favors, jewelry, toiletry products, cosmetics, makeup, bridesmaids favors, and garments, to water bottles, snacks, lunch, sandwiches, goodies, candy and so many others! The world is your oyster. The ergonomically twisted handle ensures comfy carrying without tiring your hands and wrists! Personalize every gift and make your beloved ones feel unique and special. Bridal or a bachelorette shower. Tea or wine tasting party. Then These Kraft Brown Paper Bags Are The Way To Go!